Protect all your CD and DVD from scratches and dust! Usage: Collect CD/ DVD, Wallet Envelope. Paper bags only, the CD is not included. 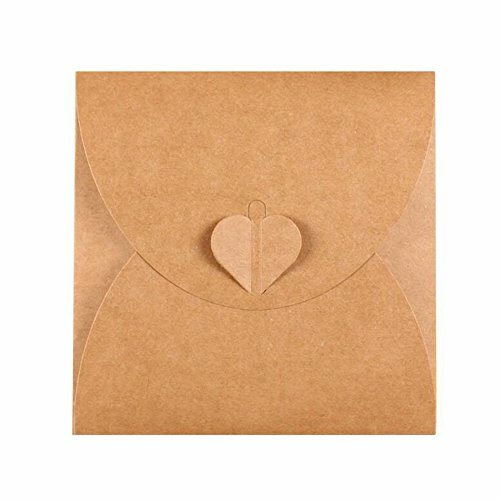 Kraft Paper Sleeves Envelope,100% brand new, from Ocharzy. Material: 280g heavy weight kraft paper, better quality and thicker than regular paper. BLANK! NO EMBOSSING OR PRINTING - The front of the envelope free of embossing! NO markings or logos! You can paint or stamp whatever you want on them. These work great for stamping! They're sturdy and you can either write on them or add stamps or stickers. It is good for DIY! This CD sleeves is affordable, easy to use. If you have any questions about this product by ocharzy, contact us by completing and submitting the form below. If you are looking for a specif part number, please include it with your message.